Yonked :: Diary of a New Home: Major House Props-- I hung the picture myself! 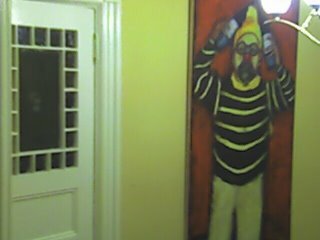 We've got a large-scale painting of a clown bee-- When I say large scale, I mean it's the size of a large door (80" tall x 32" wide) -- in fact, it was painted on a hollow door. In the interest of full disclosure, let me say that it is a painting of ME as a clown bee. This is a picture of the painting (it's actually too large for me to take a picture of it in one swoop, so I did it in four and stitched it together-- which explains the weird banding) It normally looks nicer than that. THE BACKSTORY: In 1995 I was involved in a circus that had all of the acts as insects-- in it, my main role was as the clown bee. My opening entree was the ringmaster of the circus planting a sunflower, which grew 20 feet in the air. I then come out as the clown bee, and through a running series of misadventures, try to fly up to the flower. Unfortunately, I am not able to fly, and thus the comedy ensues-- at the end of the show, the stage hands, who are all dressed as ants, working together, are able to pull me up in the air and get the flower. An ex-girlfriend of mine painted this door sized painting as a gift, and it's been greeting people in my loft ever since. And it's a really cool great painting (I don't care what ANYONE says!) I've gotten lots of great comments about it, even though it's not the most flattering portrait of me or anything. It's been sitting at the head of the dining room table for the last two years, because I didn't want to consign it to the garage, but didn't have the nerve or the gumption to hang it in the only place in the house where it made sense to hang it-- our staircase. The staircase wall goes up two stories, and is not readily accessible to anything. (IE, it's hard to get to) Plus, although it's a hollow door, it's still a door you know. I didn't want it to fall down on my head. And furthermore, I was thwarted by ennui. It was doing fine where it was. No need to move it. Well, it turned out I was right. Hanging it up involved measuring the wall, figuring out where to hammer in the two fifty pound picture hangers to hold it up (it weighs less than 20 lbs, but I'd rather be sure), figuring out where to screw in the hooks on the back of the painting to hold it up (and match up with the hammered areas), taking out the Little Giant ladder I bought and figuring out how to make it as tall as possible, and then ascending it, on the stairs, fearful of falling, and then carefully hooking the hooks on the door to the doors on the wall by holding the side of it over the open staircase. THE PAINTING ON THE WALL! I'm happy to say that it all worked out-- the painting is up, the ladder is back in the garage and I didn't fall down, break any bones, lights, or other important attributes of either myself or the house. And the painting is pretty damned level! 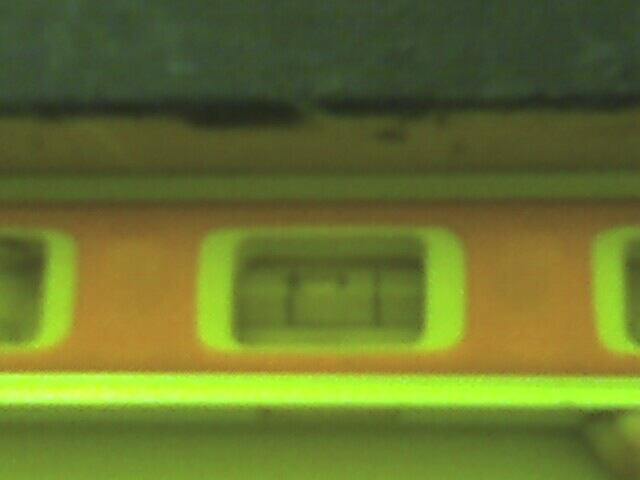 This is the level at the bottom of the painting! Comments on "Major House Props-- I hung the picture myself!" Yasher Koach! That earned you some serious "Honey do" points right there! Just read the story in today's Times. Mazel Tov! Wishing you all the best!